Apple may have plans to reintroduce the discontinued fourth-generation iPad alongside the 8 GB iPhone 5c tomorrow, giving customers a lower-cost iPad option with better specs than the existing iPad 2. A source that spoke with 9to5Mac has indicated that shipments of the fourth-generation iPad with Retina display are arriving at Apple retail locations, with notices that they're to be opened tomorrow. Reliable KGI Securities analyst Ming-Chi Kuo initially predicted the shift from the iPad 2 to the iPad 4 back in February, suggesting Apple would wind down iPad 2 production during the first quarter of 2014, replacing it instead with the more powerful iPad 4. Apple originally ceased selling the fourth-generation iPad when the thinner, lighter iPad Air was introduced in October of 2013 and continued to offer the 2011 iPad 2 as its lower-cost tablet option instead. 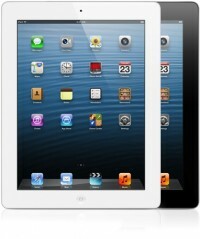 Priced at $399, the iPad 2 is currently offered for $100 less than the $499 iPad Air. Apple has presumably opted to keep the iPad 2 in its lineup because of its position as the last Apple tablet using a 30-pin adapter, but with its A5 processor and 512 MB of memory, it is significantly less powerful than the iPad 4, which includes Apple’s A6X chip with 1 GB of memory. With the iPad 2 being replaced by the fourth-generation iPad, Apple's tablet lineup will be all Lightning for the first time. It's also possible Apple's current low-cost iPhone option, the iPhone 4s, will be discontinued at the same time in favor of the 8 GB iPhone 5c, marking the end of the 30-pin adapter in all non-iPod mobile products. Apple's iPod Classic will be the sole device using the adapter if the iPhone 4s and the iPad 2 are replaced with updated options. Pricing for the 8 GB iPhone 5c and the reintroduced fourth-generation iPad have not yet been revealed, but it is likely Apple will make an announcement on the new products tomorrow. Remember when Steve Jobs came back, one of the things he did was kill off a bloated and confused product line? The iPhone comes in three models, the iPad (if this rumour is to be considered true) comes in five. Both use two different types of connector and the price difference between some iPad models is minimal, with the addition of the 8GB 5C, this is likely to be the case again. I think some serious pruning is needed. But that is just my personal opinion. How about a Mac mini refresh tommrow ?? Anyone anyone ? Truly innovative. Who would think that reintroducing an old, outdated product would make it new again? This will be called the "Tim Cook Distortion Field". What's with everyone talking about "innovation" on this announcement?? Assuming they do this to remove the iPad 2, this serves two purposes. Removes any lightning connector devices, and removes devices that will likely not get iOS 8. To those complain about lack of innovation, this is not a new product announcement. It is replacing old equipment with less old equipment for likely the same price. A better value. How is a "non-retina Macbook Pro" useless?